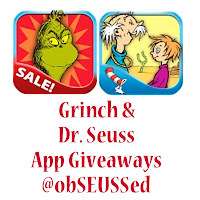 If you love the Grinch I'm giving away How the Grinch Stole Christmas app + 2 more apps today Dec. 9, 2012. Click here to enter by leaving a comment. I’ve seen a variety of great Grinch ideas online lately so I am sharing a few of my favorites today. Once I saw these Grinch Pills on Pinterest I had to make them. I’m not positive where the poem or idea originated. It does take some work formatting things to print your own so I found someone who sells them on Etsy if that would help you be a little less Grinchy during the holidays. I found the Big Pack of Tic Tacs on sale so I could make 5 of them. I made theseGrinch cookies and took them to a cookie exchange last week at Jen’s house (from the fabulous blog Tatertots and Jello) See recipe below. I made this record stand for our diner to display party food. Here are a few Grinch Cookies. Click here for more info and pictures of Mount Crumpit Melt-a-way Grinch Cookies. I’ve been crushing this Grinch quote by Laura of Announced Design. You can order the digital print from her site. I found this Whoville Tree by Stevie over at Garden Therapy. I love how tall it is and how the top arches over. This adds a whimsical feeling to a natural tree. My kids love working with perler beads. They will sit down for 30-45 minutes filling up their boards with patterns. I have a whole stack waiting to be ironed. I’m going to show them this and see if they can duplicate it. A Grinch out of perler beads, by April Hanna as seen on Pinterest. I also spotted this cute Grinch crochet hat on Pinterest and found out they sell the pattern on Etsy if you’d like to try to make your own. This vibrant Grinch Christmas Wreath is incredible with so many details. You can find it on Etsy as well. This Whoville gingerbread house village can been seen at Sweetopia. I’d love a set of these Grinch yard display “who” characters. Can you believe they were stolen last year? They put up a sign that says “Lost Child, Have you seen Cindy Lou who is no more than 2?” I hope someone returns them. I wonder if I could get my husband to make a set for our yard? I bought these Santa Bags ($4-8) at our local DownEast Outlet (located about 3500 S. 3500 West in West Valley City, Utah) that sells Pottery Barn returns. Some had monogrammed names on them so I bought Grinch fabric on eBay by Kaufman and am sewing it on the bags this week. The Grinch visited my daughter’s school reading night at Barnes and Noble so I had to get my picture with him. The kids did too but they were a little scared of him. This mask is a little freaky. I love that Grinch Christmas Tree!